We didn’t have any crab rangoon on our road trip, but we did see a ton of roadside Chinese restaurants that made me constantly shout out “crab rangoon!” I’m so happy that crab rangoon came into my life. Crab and cream cheese really go together. 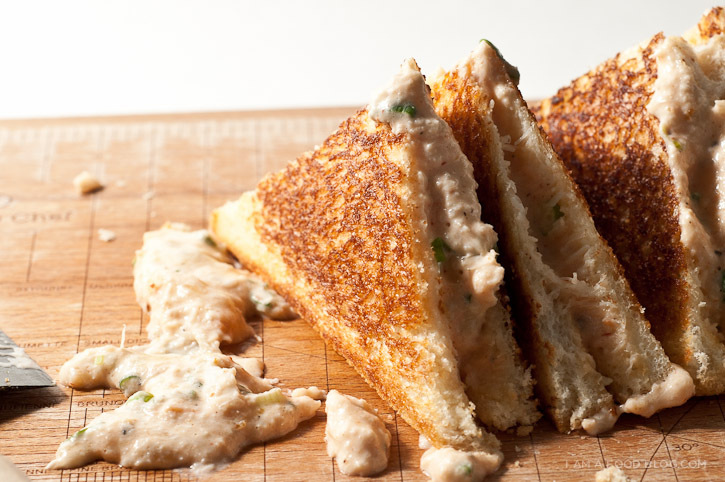 It got me thinking, if crab and cream cheese taste delicious in a wonton wrapper, wouldn’t they taste just as delicious in a grilled cheese sandwich? April is National Grilled Cheese Month and since I love love grilled cheese (I even had a DIY grilled cheese birthday party!) I’m going to run with any excuse to grill up a bunch of sandwiches. This recipe will make an extremely messy, extremely good sandwich. When slicing into it, your filling will fall out. Don’t worry though, just have some extra toast on hand for moppage. I skipped the extra toast and just used my fingers to scoop up the extra oozy filling – it was just that good. I recommend making and eating this sandwich by yourself, or at least with someone who won’t judge you when you have crab and cream cheese dripping down your chin. If it makes you feel better, I won’t judge – I’ll just be sitting there with stuff dripping down my chin right next to you. 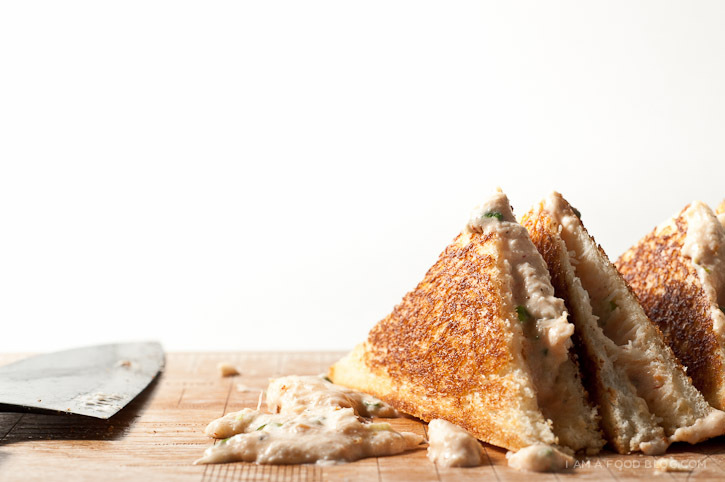 I am crab-filled, I am grilled: I am Crab Rangoon Grilled Cheese! Mix together the cream cheese, crab, and green onions. Taste and season with salt, pepper and sriracha (if using). Heat a non-stick pan over medium to medium low heat. Make your sandwich by spreading the crab mixture in-between the two slices of bread. Butter the outside slices. 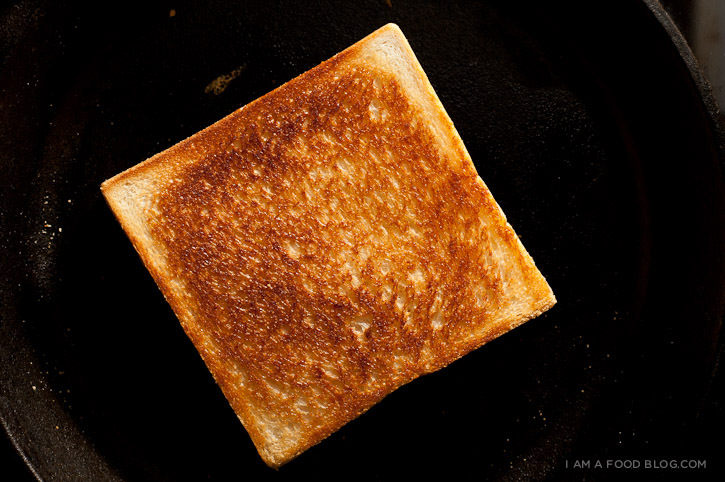 Place the sandwich in the pan and let it get toasty and golden brown. Check on it after 2 minutes. If golden, flip and grill the other side of the sandwich. If need be, let the bread grill longer, but keep a close eye on it. After flipping, the second side will brown faster so stand by with your spatula. When done, plate it up and slice into triangles, squares or whatever your fancy. Enjoy hot! 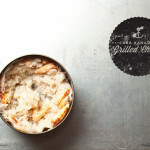 I loooove crab but for some reason am terrified to cook with it! These look delicious though, and simple, so I might just one whip one up in the near future. Thanks for sharing! I really like the design!! Can you tell me what texture did you use for that black badge? This looks amazing! 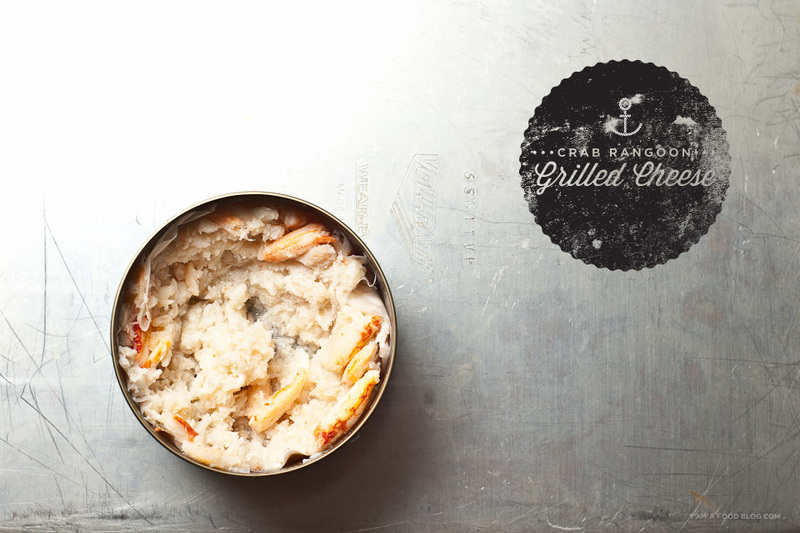 Do you have a canned crab preference, in terms of brand or type? Thank you!